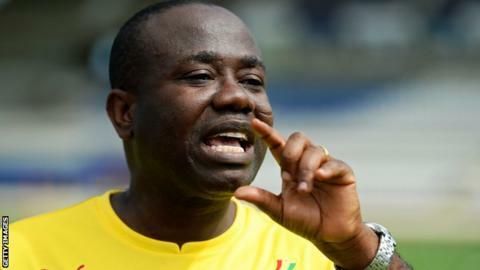 Despite winning another stint as president of the Ghana Football Association BBC Sport's Michael Oti Adjei says the jury is still out on whether Kwesi Nyantakyi is the right man for the job. Nyantakyi was elected unopposed for another four-year term on Tuesday and means he extends his decade-long tenure as head of the GFA. On the evidence of his first 10 years, he has earned the right to continue BUT there is still a huge amount of work to be done. It is something Nyantakyi acknowledged in his acceptance speech in Tamale at a congress that was overshadowed by threats of legal action. He said: "A new term in office is a new opportunity to build on the huge successes we have chalked over the past ten years. "That includes - but is not limited to - three successive appearances at the World Cup and Africa's only Under-20 World Cup title. "A new term in office also gives us the chance to fix our shortcomings and set new milestones to put the game on a stronger footing in Ghana." Too much emphasis on the Black Stars? Nyantakyi and his leadership have often claimed much of the credit for Ghana's regular presence at the World Cup. However that success is also seen by some as a shortcoming because of the role the GFA has played in deepening the perception it is only interested in the Black Stars and is riddled with wasteful spending. The last World Cup in Brazil was particularly damaging for the GFA's reputation - a bonus row that was resolved only after US$3m in cash was flown to the tournament to pay the players. That increased the perception of Ghanaian football fans that the national team they back wholeheartedly is nothing other than part of a money making tool for others. The GFA is still reeling from the effect of that after a public commission of enquiry questioned payments made to some of its executives. There is still a pending investigation by the country's Bureau of National Investigations into some of the issues. While Nyantakyi and his supporters have called the process a witch hunt, his critics have backed it as a legitimate attempt to sanitize the country's football. But restoring a battered public image is not Nyantakyi's only problem in his next term of office. His administration has ensured there is more sponsorship in the local league over the last 10 years but stadium attendances are dropping at an alarming rate. The result of fewer fans has resulted in clubs struggling to make any money from gate proceeds which traditionally were one of their biggest sources of revenue. The GFA believes the Ghanaian media's obsession with foreign football is chiefly to blame for the poor attendances and lack of interest in the local league. Its communication director has gone as far as to suggest that the country should ban live television coverage of foreign football matches on free-to-air TV on traditional match days. The problem here is that the amount of foreign football available on free-to-air TV is fairly insignificant when compared to what is on offer on the country's premier pay TV, which happens to be one of the biggest sponsors of the GFA. Nyantakyi also has to tackle the sharp disparity in the performances of the Black Stars and the country's other national teams. Ghana's women's national team has dropped off as one of Africa's best sides. While defeat to Congo in the Olympic qualifiers has prolonged absence of Ghana's under-23 side from the football tournament in the men's division to 12 years. The shortcomings notwithstanding, it is difficult to see who could replace Nyantakyi at the moment as head of the GFA. The fact that he stood unopposed is either indicative of the lack of other options or a strong belief that he is by far the best man for the job. Having moulded the Black Stars into one of the most viable football brands on the continent, he will be keen for them to win a first major title since 1982. Another task will be to ensure that the country's clubs can impress in continental club competitions again, the country's last success came in the Confederation Cup in 2004 with an all-Ghanaian final as Hearts of Oak beat archrivals Asante Kotoko. And if he manages to fix the poor attendances in the stadiums for local games and rid the association of its image as a money drain, there is no doubt he will be around for a long time to come.